Looking at over-the-knee boots you think: “Wow! That’s a lot of boot!” It sure is, but if you love boots in general (and who doesn’t? ), the more boot, the better. The two schools of thought on these boots is whether to go for the strictly equestrian, conservative type, or the loose fitting, “slouchy” style, favored by the bohemian set. This, of course, depends on your personality. In any case, wearing over-the-knee boots, also referred to as musketeer boots, requires confidence and swagger. 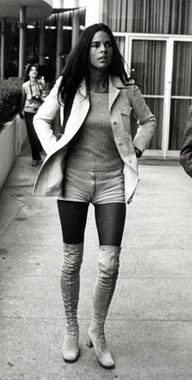 Actress Ali MacGraw wearing over-the-knee boots. 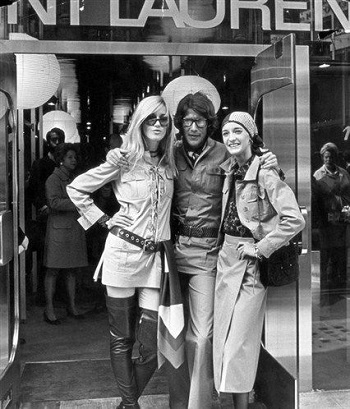 Catherine Deneuve (on the left), Yves Saint-Laurent and Loulou de la Falaise. Good over-the-knee boots are expensive, of course, but you can get a lot of fashion mileage out of them. You can wear them practically all year round. Generally, these boots go well with all kinds of skirts and dresses, as well as tights, in the traditional equestrian style, but not with jeans, in my opinion. That’s overdoing it, I think. The most popular colors are black, beige, and grey. Many brands make them. Spanish designed and made boots are usually a good bet because of good quality, style, and reasonable heels. Their prices are also very reasonable in comparison to many other high-end brands. Here are a few pairs that really stood out for me this time around. The two first ones are currently available at YOOX, the Spanishoegallery Blog‘s affiliate partner. 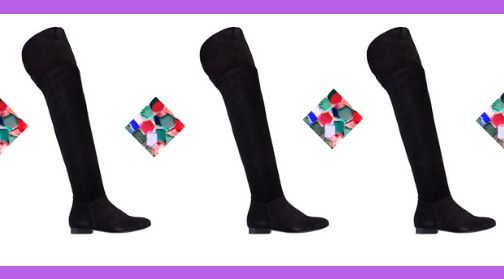 Pretty Ballerinas suede effect over-the-knee boots. $378 on YOOX. Boot length 23.4 inches, boot width 10.92 inches, heel height 1.37 inches. 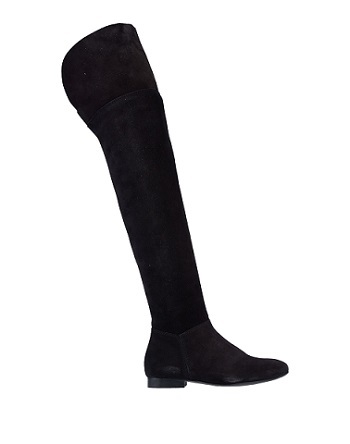 This classic close fitting over-the-knee boot is by Pretty Ballerinas. It features a very tall shaft with ties at the top, to keep them from slipping down. These boots will hug your leg like a glove. At the top, on the outer side, there is a little bohemian touch: a pretty turquoise and pink butterfly embroidery, very much in keeping with Pretty Ballerinas signature flirty style. The boots are currently available on YOOX (click on the image to go to the product page). YOOX often runs sales and promotions, so keep an eye out for those. Over-the-knee boots by Pedro García. $510 on YOOX. Boot length 23.4 inches, Boot width 13.26 inches. I love this over-the-knee boot by Pedro García. It has an impeccable equestrian profile adapted for modern day fashion needs. 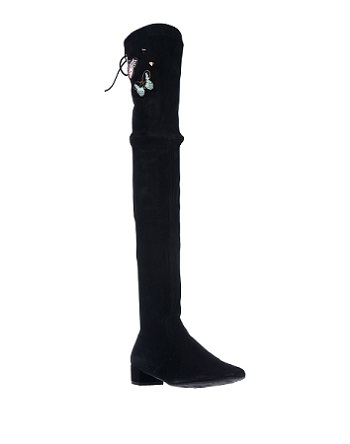 These boots are not as leg-hugging as the Pretty Ballerinas above and are just plain black suede. The small heel gives you a bit of an elevation, making the boot very comfortable to walk in. Simple and chic. 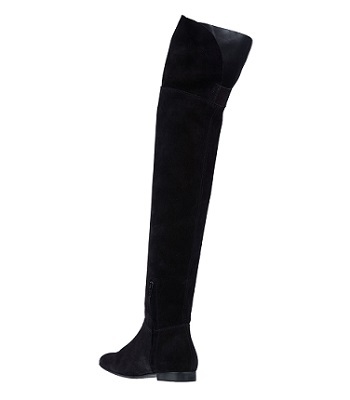 Over-the-knee black suede boot by Pedro García . To buy, click on the image. Disclaimer: if you purchase an item through a product link featured on this website, the Spanishoegallery Blog will get a small (3%) commission. All items on this website are curated by us. Thank you for keeping this independent website going! Over-the-knee boots by Paloma Barceló. 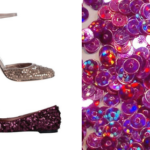 Leg height is 25.2″, heel height: 2.8″. Currently at 440 Euros on the Paloma Barceló website. Sixties vibe: slouchy style over-the-knee boots by Paloma Barceló. Photo courtesy of IG @lulufigueroadomecq. 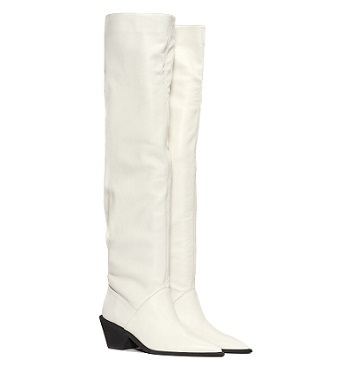 These “slouchy” style over-the-knee boots in gesso white (gesso is basically the color of primer) with contrasting black soles and heels are definitely a throw-back to the a 60s and 70s bohemian fashion. With their loose fit, the boots are rebelling against the uptight equestrian conservatism of the black boots above. The gesso color is an interesting choice – it is the color artists use to prime their canvases. Well, you could look at these boots as a blank canvas onto which you can display your personal attitudes and passions. As an aside, I find white boots irresistible, if you have the wardrobe, but, most importantly, the pizzaz to pull it off. In the photograph above the person wearing the boots is Lulú Figueroa Domecq, an artist and a Spanish aristocrat. I think that all three pairs are awesome. If you can, treat yourself this holiday season. Merry Christmas from the Spanishoegallery Blog!